The Cover Contessa: Please Welcome Author A.M. Hargove and Giveaway! Please Welcome Author A.M. Hargove and Giveaway! 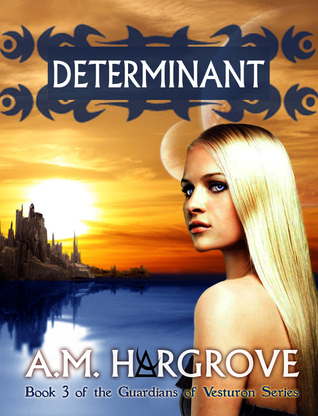 Today, in conjunction with SupaGurl Tours, I am very excited to be taking part in the blog tour for A.M. Hargove's book: Determinant! As part of this tour, Anne has stopped by for an interview! But before she answers my questions, let's take a look at her newest book and get a peek at the trailer! And now, let's hear what Anne had to tell me! I graduated from college with a minor in journalism and was only one class short of a double major in it. I had always envisioned writing romance novels as I was hooked on them from the time I was in junior high. I used to hijack my mother's books back then (so you might say I inherited my addiction!). My career path took an entirely different route and I never had the time to focus on writing until recently. That depends on the book. For example, I started writing Determinant at the beginning of April and it was in my editor’s hands the second week of May. I’m currently writing Dark Waltz, which is the first book of my newest series (an adult spin-off from Determinant) and it’s taking me longer because I’ve had a ton of interruptions. If I can focus solely on the writing, I can write 5000 to 7500 words per day. If I can escape to our mountain house, where I’m alone, the count can skyrocket. I get asked that a lot and I honestly don’t have a good response. I have all kinds of ideas floating around in my head. When a good one lands, it just sticks and keep hounding my brain until I write the story. The character literally bugs me to death. I get up around 6:30 am, clear out my inbox, and start writing. I could write all day. I never tire of it. I sigh when I hear the garage door opening, which is my signal that my husband is home from work. LOL I’m happy to see him, but that means it’s time to close up the computer! I’m so fortunate to be at the stage where the balance is all my choice now. My youngest daughter is in college and I’m writing full time...so the only balance I have is my husband, myself, my pooch who is my constant companion, my volunteer activities and my fun stuff! Lots of romance, tons of conflict, mystery, thrills, and there always has to be that big bad guy! Ending the thing! I’ve had other authors tell me they had difficulty getting to 70,000 words, and I had trouble cutting it off at 100,000. I could go on and on and on! Of course, then the characters would be 90 years old and in the nursing home, LOL! I’ve written three full length books and one novella and I’m currently writing my fourth full length book. I can’t say I have a favorite. I love all of them. The Guardians of Vesturon is based on a family of six siblings, and I’m in love with all of them. The race is from another planet, and not to give too much away, Vesturions tend to be unusually attractive. They are aliens, but human like in appearance, except their characteristics are unlike any human you’d find on Earth. Each of the characters are different in their personalities, from bold and demanding to sensitive and tenderhearted. Because of the differences in them, the books are different too. No, I can’t say that I do. I think I identify more with Rayn (from Survival and Resurrection) than any of them, but that doesn’t mean he’s my favorite. Anywhere I can. I use a laptop, so I can work anywhere. I worked for corporate America for over 25 years and I decided that I wanted to be a free bird and never wanted to work by anyone else’s rules again. I decided to self publish because I could do it my way, when I wanted and how I wanted. I never considered any other way. I have a friend who’s a literary agent who keeps bugging me, but I keep refusing to go that route. I’m not interested in deadlines, or working under anyone else’s guidelines. Yes, but I never trusted what they said, lol! I think family doesn’t want to hurt your feelings, so everything they told me I took with a grain of salt. Now when I discuss my books with them, they’re more open about things and they tell me if they like a certain scene better than another. Of course, my husband and son aren’t big romance fans, but I have to hand it to them because them read and critique everything. They keep telling me they see the books as movies. I’m an outside hiking, backpacking, camping kind of girl. If you’ve read Survival, all the backpacking scenes that took place up in the Great Smoky Mountain National Park and on the Appalachian Trail were from my own experiences. That’s my gig. If you’d ask me if I had two months to do anything I’d want...I’d want to put on my pack and start at Springer Mountain in Georgia and hike through Virginia on the Appalachian Trail, and go until I hit the two month mark. I’ve done most of it through North Carolina, which is the most mountainous, but I’d like to do more. Do it! Write anything...short stories, start a blog, write a novella...just do it. Attend local seminars. Join Goodreads. And read, read, read. Read in the genre you love, but read everything you can get your hands on. If you love fiction, read fiction, all kinds of it. Okay, this is SO not fair! I can’t possibly answer this question because there are so many books I love. I can honestly say there wasn’t really one author that inspired me to write. I think every author of every book I ever wrote, inspired me to write. And that includes book I hated! But to get back to authors I love, I would have to say JR Ward ranks high on the list because she’s brilliant. She has excellent story lines and what’s not to love about those brothers? I love Jennifer Armentrout’s book. I think she’s a wonderful YA author. I haven’t read her adult books yet, though they’re in my queue. I love Dannika Dark’s Mageri series. I love Sylvain Reynard’s books Gabriel’s Inferno and Gabriel’s Rapture. They’re beautifully written based on Dante’s Divine Comedy. I tend to read Indie books (for the obvious reasons!) and I love John Corwin, Janelle Stalder, Shelly Crane, Lila Felix, Christie Rich...and I could go on and on! Absolutely! I have a group of AWESOME beta readers--Terri, Alana, Midu, Juls, Shelly, Lissa, Fiona and Laurie. They help me with everything from the story line to grammatical issues, wording, etc. I don’t know what I’d do without them. And then I have a proofreader and my super awesome editor Jenn Nunez. Oh yes ;-) I mentioned Dark Waltz above. It’s an adult paranormal/sci-fi/urban fantasy blend that’s a spin off series based on a character, Jurek Herdekian, from Determinant. It’s quite a stretch for me because it’s my first venture in the adult arena but it’s going to be much darker than anything I’ve written before. Jurek, whom you’ve met if you read Determinant, is sort of a good/bad boy, but he was such a strong character I couldn’t let him go. He demanded his own story so he got his way and that’s what I’m working on now. As soon as I’m finished with this first installment, I’ll start working on the fourth book in The Guardians of Vesturon, reEmergent. Thanks Brooke, this has been so much fun being here today! Thanks, Anne, it's been great having you here! Below is a little information about Anne and if you scroll to the end, a little surprise giveaway! A.M: Hey Boss, I'm calling to let you know you can pick up my luxury Ford Focus at Starbucks near the interstate. A.M.’s Boss: Why ever would I want to do that? A.M.: Hey hubs, can you pick me up at Starbucks? A.M.’s Hubs: Sure...having some car trouble? 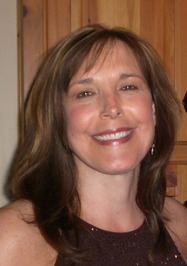 So began A. M. Hargrove's career as a young adult paranormal romance author of self-published ebooks. Her series, The Guardians of Vesturon, centers around a family of six siblings and is a mix of humor, mystery, suspense and of course, love. Survival and Resurrection are her first and second full length novels, and Beginnings is her prequel novella to the series. Determinant, her third in the series will be released 6/30/12. The book sounds amazing! Congrats on the book Anne! !